Which Tipping-Point States Favor Trump? Our tipping-point index identifies the states most likely to provide the decisive vote in the Electoral College. Here’s the deal: Our forecast models simulate the election thousands of times every day. 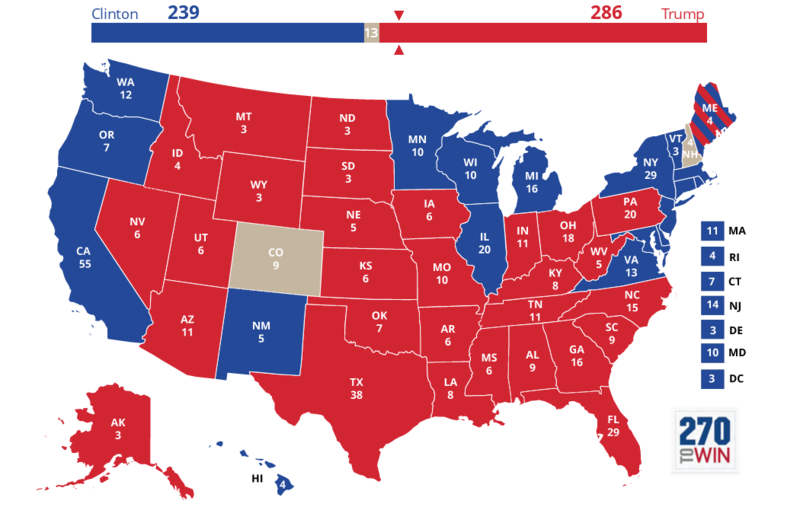 In each simulation, we line up the states sequentially by the margin separating Hillary Clinton and Donald Trump. 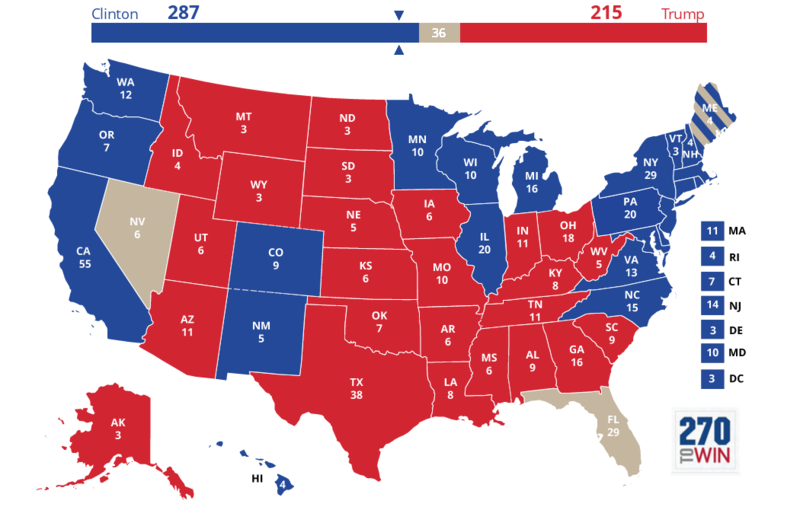 Start adding up the winning candidate’s electoral votes beginning with the state they won most comfortably and working your way toward the more competitive states, and the tipping-point state is the one that provided the 270th electoral vote. The top tipping-point state — according to polls-only model run from Tuesday evening — was Florida. Still, that tells you Florida’s chances of deciding the winner, not who the winner tends to be when Florida decides. 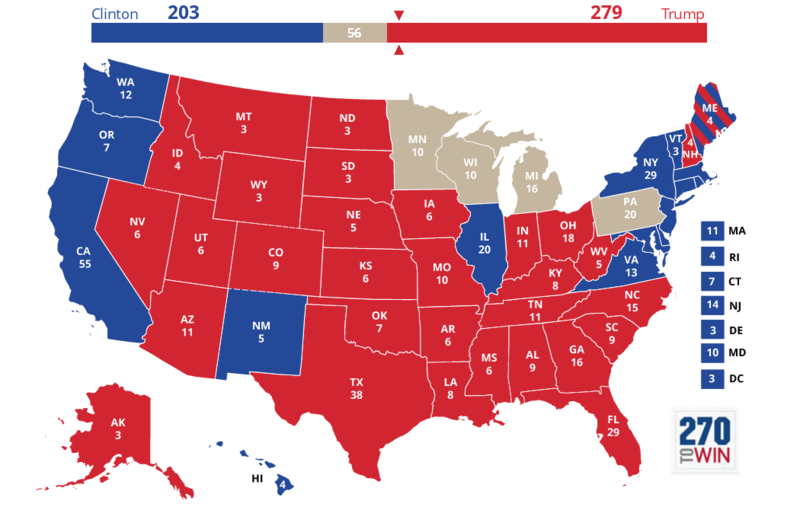 So let’s take a brief tour through the swing states. Which states does Clinton want to tip the election? Which states does Trump want to decide? In that late-Tuesday polls-only model run, Clinton had a 71 percent chance of winning the election; Trump had a 29 percent chance (the numbers haven’t inched a bit towards Trump since then). So if Clinton wins more than 71 percent of the time in simulations where a given state tips the election, that’s a pro-Clinton tipper. Any state that tips the election to Trump more than 29 percent of the time is pro-Trump. Nevada, Michigan, Arizona and Wisconsin. North Carolina and Minnesota: Trump wins 33 percent of simulations. Florida: Trump wins 32 percent of simulations. Trump does not have as many avenues to victory as Clinton, but a few states are slightly better than average for him. When North Carolina tips the election to Clinton, it’s typically in a fairly conventional map — the Blue Wall holds, and prizes like Florida are just icing on her cake. Pennsylvania and Virginia: Clinton wins 76 percent of time. Colorado: Clinton wins in 74 percent of simulations. Others: Ohio, Iowa, New Mexico. If one of these states is tipping the election, things look good for Clinton. Virginia putting her over the top is a sign that she has made substantial inroads into states like Ohio and Iowa. But when Pennsylvania is the tipping-point — the second most-common scenario — it’s usually in a more comfortable Clinton win, suggesting she’s also held the Midwest. Ohio is irrelevant for her map, but she wins it 60 percent of the time. She wins Florida in 71 percent of simulations, and even Arizona is better-than-even odds of being hers. Pennsylvania tips the election to Trump most often in maps where the businessman has already banked Florida and Ohio, but states like Michigan and Wisconsin are firmly in the Clinton camp.